Also, I could not experience Plymouth. I thought it was a problem with Plymouth and believed updates will fix it, but that did not happen till date. Today, I decided to fix it and went looking around for a fix and got it working. I found this thread on Ubuntu Forums and was able to fix it by following it. I checked by boot options and noticed that there was only “quiet” specified, and no “splash”. I added “splash” and it worked. 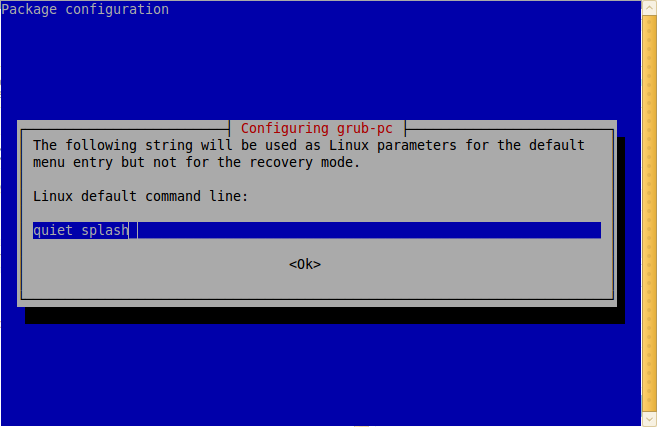 Launched the terminal (Accessories > Terminal) and typed in sudo dpkg-reconfigure grub-pc. I left the linux command line field empty and hit enter. In Linux default command line, there was “quiet” already. So I added “splash”(without quotes) after a space. Then I pressed enter and again enter. I chose the default in Grub Install Devices and pressed enter again. and rebooted. I could see plymouth now. The solar theme looks great. Your graphics card may not be compatible with Plymouth, so don’t expect it to work, not so early. I hope it supports yours in later developments. UPDATE March 30: Kernel updated to 2.6.32-18 and Plymouth to 0.8.1-1ubuntu3 but the problem still persists. Please follow bug 551062 at Launchpad to find out when it is solved. Please share your Plymouth experience. WOW!!!!!! thanks a lot!!!!!! your saved my life!!!!! thanks!!!!!! i love you 😀 !!!!!! I am trying to fix it, but want to get rid of Plymouth instead of enabling it. Removing plymouth should work, but the error messages will still appear. I don’t know what is the problem, but when I choose to install usplash, it marked plymouth to be removed but gdm too was marked for removal. Try installing kdm or xdm as a replacement.